Big thanks to cvm3 for snagging this for me! 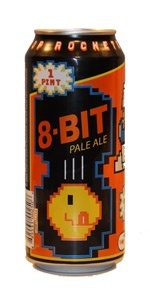 As a child of the 80's growing up with Nintendo and ect, you can't help but dig that retro gaming can! Pours a dark sunny orange color, slightly hazy and opaque, with an off-white cream colored finger of head. The aroma was a bit earthy with the hops, floral, but with a pretty noticeable biscuity malt profile. The taste was zesty, floral hops, with a very tiny lemon zest note and a much less malty backing than the aroma. Lightly crisp, clean, lighter bodied, with a clean refreshing finish. Drinkability is great; a very sessionable ale. This thing isn't pushing the envelope in any respects, but the Galaxy hops definitely make this a somewhat unique pale in my mind. It's tasty, smells good and it's very drinkable, making this a fantastic summer beer. i like things like this. old school. very pale, yellow beer. thick head dissipates to soapy lacing. crisp and a touch spicy with good hops bitterness that lingers. decent carbonation and a clean finish. kind of like your wife, this is familiar and you know you'll like it. there may be flashier things out there, but this is one you can keep around and people will know you've got pretty good taste. Orange color with a finger of fluffy white head. Faint pine and floral hop smell. Medium feel. Taste has sweet malt, citrus, and floral hops that all kind of come at you at once. Pretty good, one of these beers that blurs the line between a hoppy APA and a lighter IPA. Appearance – Nice darker yellow, almost orange color presents itself in the beer, with excellent bubbles action visible inside the beer. Good two finger pure white head comes to the surface and hangs for a minute or two, and this beer leaves excellent lacing. A really impressive appearance on this APA. Smell – The smell wasn’t quite as impressive as the appearance, but still pretty good. You could certainly tell the beer was hopped, as the citrus/grassy, fruity notes basically dominated the nose. There was a hint of malts and toast in the background, but not much. Taste – Much like the nose, the hops bowled everything else over, but in a good way. This is a damn tasty beer! Nice hoppiness throughout the taste, with a malty backbone, makes this quite an impressive beer. I really enjoyed it. Mouthfeel – Good level of carbonation, medium to medium-high, and a nice bitter grapefruit finish at the end with just a hint of alcohol. Well balanced. Overall – Good packaging, great taste, sessionable, very good-looking, what isn’t to like about this brew? I actually drank my first one straight out of the can, and liked it so much I decided to actually pour another one and review it. I didn’t have any intention of reviewing a beer tonight, but this one was just too good. Excellent job by Tallgrass, probably one of my new favorite APA’s out there!